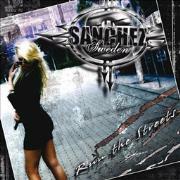 Borås/Swedish band SANCHEZ is not far away from where I write these worlds. The band consists of Jose Sanchez, lead vocals, Kieven Klevmyr, guitars, marc White, bass, and the obvious Mr. Drumhead completing the line-up. As individuals they have opened for acts like DEE SNIDER and PAUL DIANNO. As a band they haven´t really got all that much under their belt. The setting is classic AOR/glam/hair metal, style wise they live the legend. They have handled production themselves, and they promise a trip back to the likes of DOKKEN, surprise me! The KISS feeling is there in “Stand Up (For Your Rights)”. The beginning is the worst in clichés, and the voices… It seems no one can hold a clear note? They get off better with “We Got Your Love”, the thunder intro, the melody, but again, the voices. The title track is of cause in classic fashion a good refrain, but it also loses in the voice department. The bad thing is that it gets worse. Both “Friends” and “Rock & Roll Stars” are watery, and the first is plagued by nasal vocals, to be polite. Possible grooves and a quite good power ballad like “Empty Words” may come and go, the vocal problem remain. “Don´t Wanna Get Around” deserves a singer like DON DOKKEN, but gets another treatment here. The overall production is odd, blurred or something. The dangers of handling things yourselves, like trying to be your own car mechanic with a 2011 Volvo… Ok, to summarize things up; The songs fare ok, the sound doesn´t, and the vocals are a big no-no. It breaks my heart but this is one of the lowest points of 2011.